The very fact that you are reading these words is cause for celebration. We are witness today, actual participants in the greatest Bible story ever written, the generation that ushers in the Geulah Shleimah (Complete Redemption). It is with this small coin, a coin of fire, that we make the move from Exile to Redemption. When the barriers of Exile, the disunity, melt away to reveal a unified people, a people ready for Redemption. Production began on 14 Adar II, March 23, 1997 of the first independently motifed ceremonial Half-Shekel in 1,927 years. The first minting of 1,000 coins is currently under production. The coins should be ready for delivery around Shavuot, in early June, 1997. (See our directly from this website or from your local synagogue or whatever Jewish institution services the needs of your community. If your synagogue has not yet signed on as a participating institution, please download the Institutional Application bring it to the institution's office, have it filled out and return it to us in Jerusalem. We anticipate that this first year issue will quickly become a cherished heirloom, and we will produce a quantity according to the number of orders received. Cut off date for purchase of this issue will be Rosh Chodesh Adar 5758 (2/27/98). From Rosh Chodesh Adar we will hold an international competition for the coin design for the following year. You may submit designs from Rosh Chodesh Adar until Erev Pesach 5758 (4/10/98). The ten best designs will be posted on this website and everyone can E-mail in their choice for best design. The winning design will be used for that year's coin. We will post more information as we get closer in time. Disposition of the donated coins. 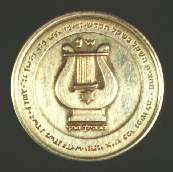 Once the coin is placed in the shofar-shaped recepticle and the Blessing is recited with the accompanying "Yehei Ratzon", the coin takes on the status of "Hekdesh", or Sanctified Property. It now belongs to G-d, and any misappropriation is to be avoided, and failure to safeguard it unthinkable. We are creating a network of Levites to handle the transference from the individual minions to regional collection points from which Brink's will pick up the shofars and transport them back to Jerusalem. We have instructed Brink's that we want the coins delivered to the Offices of the Chief Rabbinate on the 25th of Adar, annually. Brink's trucks will line up in front of Heichal Shlomo, or wherever the Chief Rabbinate sits, and one by one they will unload their trucks placing the shofars full of coins in the foyer of the Chief Rabbinate's Office. They will get back in their trucks and drive away. Its Hekdesh, and the Rabbinate is just going to HAVE to deal with it. Ready or not- here we come! We have had extensive correspondence with the Chief Rabbinate over the last three years, and they are begrudgingly responding. Any lack of preparedness will quickly be rectified once the reality of the situation sinks in. What happens with the coins? As in ancient times, the coins will be emptied out of the shofars into a large vault room. From the pile of silver coins, nine baskets full are removed in a special ceremony. These "Appropriations" known as "Trumat Halishkah" went in ancient times to cover the expenses of the Temple Service throughout the year. The Appropriations are done on Erev Rosh Chodesh Nisan, the eve of the new month of Nisan. The Appropriations of today will be stored away, although perhaps we might yet get to use them already this year. 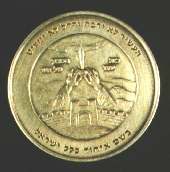 The remainder of the coins, called "Shearei Halishkah", or the "Remainder of the Office", are turned over to the municipality of Jerusalem to prepare the city for the Pilgrimage Festivals and to build and repair the walls of Jerusalem, and they may not, by the very strictest Halachah, be misused for any other purpose. The very dealing with Hekdesh will reintroduce absolute fiscal integrity, and noone has to worry that the Half-Shekel funds will go to any particular group or cause. Absolute integrity! Or they have to return it with an added fifth! What does the Half-Shekel mean to me? First and foremost, the giving of the Half-Shekel is an atonement for your soul. The rich cannot give more, nor the poor less. Whether that speaks of material wealth or ritual observance, all are equal in the fulfilment of this Commandment. Everyone has to fulfil this Commandment with exactly the same amount, you can not do it better than the next person, only the same, equally. The Half-Shekel comes to remind the unaffiliated that they are at least half a shekel, and it comes to remind the very observant that they are only half a shekel. When you internalize this precept in the deepest reaches of your soul, it will change your personality. When you see yourself as half a shekel, mamash, then you will start to see every other Jew as also half a shekel. Even if there is a Jew that you hate in your heart, G-d forbid, when you see yourself as only half a shekel, you will see that the other person is also at least half a shekel, and you can no longer really hate them, because we are all equal, and one can not hate someone who is equal. Only when people think themselves a whole shekel, where no one else is worth a prutah (an ancient penny) can disunity and hatred exist. When you give the Half-Shekel you are saying, "I am also Half a Shekel, count me amongst the House of Israel!" By giving your Half-Shekel you also establish a personal participatory relationship with Jerusalem on an annual basis. These half shekels are going to your city, Jerusalem! What does the Half-Shekel mean to Klal Yisrael? The Half-Shekel is the ultimate manifestation of the equality of every Jew. The restoration of the Half-Shekel, coinciding with the half-century celebrations of the State of Israel, signifies the move from Exile to Redemption. With the giving of the Half-Shekels on Purim of 5758, we will have reintroduced "Hekdesh" to planet Earth. Hekdesh is a level of Holiness that has not existed on our planet for 1927 years. With the re-emergence of Hekdesh, a new level of religious activity begins that will have an influence on the whole of contemporary Judaism. What has been studied as learning "for its own sake" for the last nineteen hundred years will now be as an instruction manual as custom after custom comes back on-line. What does the Half-Shekel mean for local Synagogues? Many Synagogues and Jewish Institutions are finding that a relatively small percentage of members are giving the majority of funds each year, and are interested in expanding their donar base. By becoming a participating institution, you will be able to significantly increase your donor pool, year after year. As part of the Half-Shekel project, an unprecedented outreach program will be undertaken by all streams within Judaism. Our eventual goal is 100% participation. Every congregant will reach out to friends, relatives, co-workers, fellow students, associates and acquaintences to encourage everyone to give the Half-Shekel. For those accustomed to being "once a year" Jews, where that one day is Yom Kippur, the most un-fun day of the year, let us introduce Purim, the most fun day of the year, and the day that we give the Half-Shekel. Congregations are encouraged to break up family memberships so that every person in the family has their own "membership", including the children. The congregation should provide every individual member with a Half-Shekel as part of their membership dues, thereby preparing the children to get used to giving to the congregation, creating continuity into the next generation. On Purim, everyone comes to give their Half-Shekel to Jerusalem and hear the Megillah reading and participate in the celebrations. We anticipate that this will greatly enhance your Purim attendance, and greatly energize your congregation. On February 20, 1997, while in the US, I received the donation covering the master dies enabling us to begin production. On February 26th I faxed a copy of the check to Jerusalem to the offices of the minter, and I asked that he please meet me in his office on March 23, on Purim, because I knew I needed to begin production on that date for historical reasons. Little did I know. I returned to Jerusalem on Thursday, March 20. Rested Shabbat. And early Sunday morning, the 23rd, I set out to deliver the check and begin production. As I handed over the check and received the receipt, and we began to get down to details concerning the coin, I knew deep in my being that I had just founded the Third Temple. The same feeling Herzl had exactly 100 years ago when he left the first Zionist conference in Basle and knew that he had just founded the Jewish State, I had that day. I came home and turned on CNN and lo and behold I see the Haters of Israel meeting in Islamabad that very same day, seeking a decree against Jerusalem. With the waving of hands and with words of arrogance, the Haters of Israel sought from Heaven a decree against the Holy City. Later that evening, Shushan Purim in Jerusalem, I went to hear the reading of the Megillah. As we got to the part where Haman offers his shekels to purchase the Jews' annihilation, I thought immediately of the teaching that is brought down about how the shekels we gave in the wilderness not only atoned for our involvement in the golden calf, but they also atoned for us in the future by cancelling out Haman's shekels, thereby saving us in the future. It then hit me as a revelation that once again the Half-Shekel saved us. The work of one little Levite in Jerusalem beginning production of the Half-Shekel overturned the decree that was sought in Islamabad that day! On April 8th, I received an E-mail that informed me that two other events occured on March 23rd. A lunar eclipse, and the appearance of a coin of fire in the heavens. The light of the moon was covered over, the decree sought in Islamabad. The appearance of the comet, a coin of fire as shown by G-d to Moses. In researching out the Torah of exporting and re-importing relative to VAT (value added tax) and duty concerning the Half-Shekels, an interesting scenario has evolved. Whereas exporting the Half-Shekels poses no problems, we have learned that the laws of Israel require the charge of VAT on any item imported into the country. Now this creates a unique problem. Once the coins are Sanctified on Purim, they obtain the status of "Hekdesh", Sanctified to G-d, G-d's property. Now, when those coins come back into Israel, according to current law, the VAT authorities would have to charge VAT. The problem arises; who are they going to present the bill to? G-d? Special legislation is required to recognize, in law, the status of Hekdesh as being exempted from VAT. Likewise, any attempt by the tax authorities to hold up delivery even to the extent of holding charges at the port, would be considered misappropriation of Sanctified property. Therefore immediate legislative work is required. This is a personal note of ackowledgement. There is a man who unbeknownst to himself has played an incredible role in bringing this project to fruition. Never having seen the slightest proclivity to "religiousness" in him, it did not hit me until six weeks ago, while in the Atlanta airport, that this man had in fact been on angel duty preparing the way for this project already 28 years ago. I didn't see it at the age of ten when he got me a job at the coin shop owned by a friend of his, nor on February 28, 1997 when he handed me two one hundred ounce silver bars for the production of the first coins. Yet those two events, the first preparing me with the whole Torah of coins, silver bullion, minting and distribution, and the second, giving me the silver to begin production, were the two key elements that made me a vessel able to bring this to fruition. Without this man's input, I would not stand ready to meet the challenge. That man is my dad. On behalf of all of Israel, thank you! May you mamash experience Nachas, and may Heaven grant you continued health and prosperity, all of your days. In Second Chronicles 24:4-16 we read of an earlier generation that restored the custom of giving the Half-Shekel. In that generation it was the government that turned to Levi to bring about the restoration. "But the Levites did not hasten it." "And the King called for Yehoyada the chief, and said to him, Why hast thou not required of the Levites to bring in out of Yehudah and out of Jerusalem the tax of Moshe the servant of the Lord, and out of the congregation of Yisrael...?" In our own generation it was Levi that turned to the government to bring about the restoration. And the government failed to hasten it. So this time Levi made up for last time. Kol HaKavod to Levi! "And all the (government) Ministers and all the people rejoiced, and brought in, and cast into the chest, until they made and end." As the Torah specifies that if G-d forbid, Hekdesh is stolen, it must be returned with an added quarter (homesh). In presenting this to Brink's we were informed, "No problem! You can insure the Hekdesh for 125% of its value!" Unbelievable.